Wednesday’s announcement that President-elect Donald Trump will establish a new National Trade Council signals that his administration will proceed rapidly with its promised trade war measures. The new office will be headed by Peter Navarro, a University of California professor and prominent member of the Trump campaign and transition teams, who is notorious for his advocacy of aggressive trade policies and war-mongering, directed against China in particular. During his election campaign, Trump threatened to leave the World Trade Organisation (WTO) and tear up trade deals, such as the North American Free Trade Agreement, that he considered detrimental to the American economy. He announced that from day one in office he would initiate the US withdrawal from the Trans Pacific Partnership (TPP). The TPP was not a free trade agreement but a US-led economic bloc, excluding China, to pressure Beijing to accept Washington’s demands on trade and investment. The TPP was the economic spearhead of the Obama’s administration’s “pivot to Asia” that also involved an aggressive diplomatic campaign and military build-up throughout the Asia Pacific aimed at ensuring American supremacy in Asia. Trump’s decision to pull out of the TPP is not a retreat from Obama’s confrontational policy toward China but a marked intensification on all fronts. Trump repeatedly denounced China during the election campaign for unfair trade practices, threatening to brand China as a currency manipulator and impose tariffs of up to 45 percent on Chinese exports to the United States. 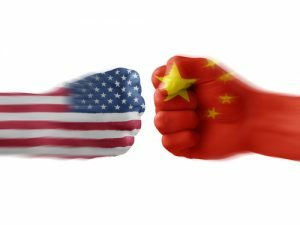 The Obama administration has already taken punitive trade action, including huge tariff increases on certain types of Chinese steel, of up to 522 percent and on some Chinese steel corporations of 266 percent. Whereas Obama, nominally at least, attempted to operate within existing international trade rules, Trump plans a dramatic expansion of blatantly protectionist measures that would result in WTO cases against the US and reprisal action. Navarro’s appointment to head the National Trade Council makes clear that it is in reality a national council for trade war. Navarro is not so much an academic economist as an anti-China ideologue. Along with Wilbur Ross, a billionaire corporate raider and the incoming commerce secretary, Navarro functioned as a propagandist for Trump’s “America First” demagogy on trade. In a Wall Street Journal opinion piece in October titled, “A vote for Trump is a vote for growth,” the pair dismissed warnings about “the trade war straw man,” arguing that “smart, tough negotiations” would eliminate the US trade deficit. Navarro and Ross targeted China, Germany, Japan, Mexico and South Korea, noting “[they] need our markets far more than we need theirs.” In reality, strong-arm tactics by the Trump administration and threats of punitive trade action would almost certainly trigger retaliation, and undermine world trade and economic growth, including in the United States. CNN reported on Thursday that the Trump transition team was already discussing proposals for tariffs of up to 10 percent on imports. Sections of American business have reacted with alarm. One organisation told CNN that Trump’s “trade policy sledgehammer” would “impose heavy costs on the US economy, particularly for the manufacturing sector and American workers.” Like their counterparts around the world, American manufacturers rely on global supply chains that would be hit by the tariffs. Navarro embodies the fact that trade war inevitably leads to war: his strident advocacy for punitive trade measures against China goes hand in hand with calls to prepare for conflict. His books include: The Coming China Wars: Where They Will be Fought and How They Can Be Won; Death by China: Confronting the Dragon—A Global Call to Action; and Crouching Tiger: What Chinese Militarism Means for the World. The last two have been made into films. Navarro and another Trump adviser, Alexander Gray, spelled out what this catch-cry means in a lengthy article in Foreign Policy on November 7 titled, “Donald Trump’s Peace through Strength Vision for the Asia Pacific.” The two were critical of Obama’s “pivot” or “rebalance” to Asia for failing to confront China aggressively enough and for reducing the size of the American military. “Peace through strength” is not a recipe for peace, but for war. Significantly, Navarro is an open advocate of ditching the One China policy, which has been the cornerstone of US-China relations since 1979, and of forging closer relations with Taiwan. Under the One China policy, Washington recognised that Beijing was the sole legitimate government of all of China and ended diplomatic ties with Taiwan. Trump has already placed a question mark over the One China policy, declaring earlier this month that he did not see why he should be bound by it “unless we make a deal with China having to do with other things, including trade.” Trump also became the first American leader in more than three decades to speak directly to a Taiwanese president, when he took a phone call from President Tsai Ing-wen. In an article in The National Interest in July titled “America Can’t Dump Taiwan,” Navarro makes clear that closer US ties with Taiwan are bound up with preparations for conflict with China. “Maintaining Taiwan as an independent, pro-US ally is absolutely critical for strategically balancing against the rise of an increasingly militaristic China,” he declared. Navarro, who had just visited Taiwan, warned of the military dangers of allowing the island to come under China’s sway—Chinese bases would allow Chinese submarines immediate access to the Pacific Ocean and extend the range of its air force. He called for the US to take steps to boost Taiwan’s military capacities. However, stronger US military ties with Taiwan pose a direct threat to China and would quickly raise tensions between Washington and Beijing. The Pentagon has long recognised the military value of the island, which is just 130 kilometres from the Chinese mainland at the narrowest point of the Taiwan Strait. US General Douglas MacArthur described it as an “immovable aircraft carrier” in the Pacific. The willingness of Trump to threaten to dump the One China policy and embrace Taiwan has only one meaning: it is the preparation to aggressively confront China all down the line—diplomatically, economically and, if necessary, through war.